-Purederm Hydro Collagen Mask, pack of 25 (!) pieces. Moisturizing sheet masks for the face, the pack can be resealed to prevent the rest from drying out! -Kanebo True Care with natural honey. A lip-balm, especially suitable for night-time. -Fasio Gradation Deep Eyes in I-6, very pretty teal-toned eyeshadow palette. -Only open to followers (so please make sure you follow me on blogger, not only via RSS)! Make sure that by your nickname or name I can clearly identify you! -Please leave a comment to this post (telling me anything you like about my blog or you would like to see more etc.). Only 1 comment per person can be accepted. -Winner will be randomly chosen by random.org and announced here by Monday, 27th of September 2010. Please make sure to email me to claim your prize within 3 days after winner is announced or new winner will be drawn. Or leave your email address in your comment entry so I can contact you! -I will ship via economy airmail, which takes between 1-3 weeks, depending on the destination. I LOVE your blog! I always visit it before I purchase any japanese brands!! Thank you so much for your great reviews! Awwww...thanks for holding such an awesome giveaway! I love all the posts about the Japanese/Asian brand make ups! Will love to see more FOTD and review posts. Enter me please in ur giveaway! I love the fact that you use a lot of Japanese products and post swatches for us because I don't have access to Japanese brands here in Holland and have to order my things online. It is always so difficult to judge the colors etc. so your swatches help a lot! always love your review about japanese/korean brand cosmetic.. I love the swatches you had on your eyes and lips. People usually just swatch it onto their hands but when you put it on, it doesn't look so good. Reviews on the texture, pigmentation and blend-ability also helps. I liked also that you started putting the e-places where you bought them or where they can be bought. Future features?... Japanese eye and lips makeups of course! I like your focus and thoughts on Asian beauty stuff. I discovered some good things thanks to you! I check your blog first before I take the plunge on buying a product online without seeing it. I love your Japanese/Korean cosmetic reviews! I don't have easy access to those cosmetics so it's always fun to be updated on what's new out there. :) Thank you for this giveaway! yeah i love giveaway! Love your blog cos i can find out what make up is good in the market! - Pin Yap from Brissyland Australia! I also love it because you feature asian brands. 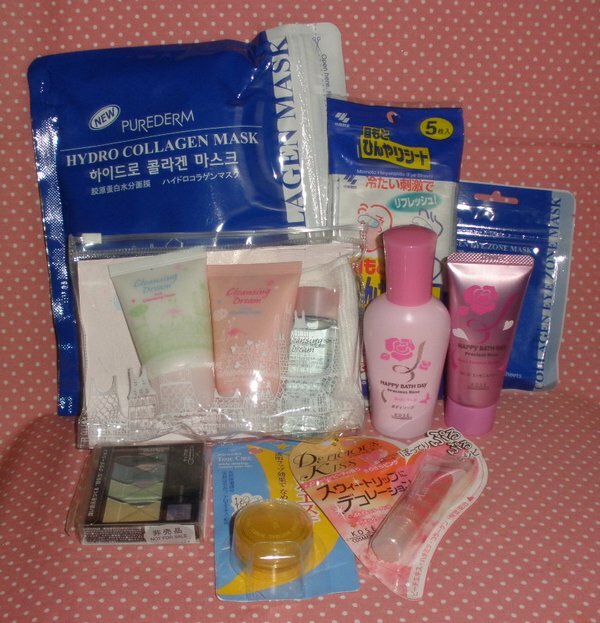 Great give away especially the face masks! Lovely blog and great pics reviews to go with it! i love your fotd and eotd + the reviews on korean brands are great. please enter me on your giveaway. i'd like to see loads of reviews ^__^ Im thinking of purchasing etude cream, but don't kno which one i should get. I'd like to see more on affordable drugstore products such as NYX, Revlon's etc. Always love your blog since the first time I read it!You blog even inspired me to make my own blog :)..
i love your reviews and even more so that they are updated so frequently! Love everything about your blog it makes me want to buy,buy,buy. Your blog was the first beauty blog i read!!!! i love how you review asian beauty products in detail. great blog! will appreciate if u could rate the product e.g from 1-5 star...or 8 over 10... will make yr blog more appealing for sure!!! I love your reviews on asian products. You try so many things that i always visit your blog before purchasing some items. Thanks! awesome giveaway ^^. I love your reviews! It's so helpful, I always check whether you've reviewed a similar item or brand to help me decide when buying japanese products. It'll be cool to see more fotd and tutorials. thank you for the giveaway! i love your blog i enjoy looking at all the product you purchase ! I <3 ur blog!!! 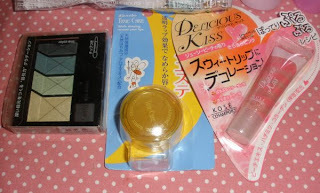 Ur blog is the first blog that I check before I purchase most of my Jap/ Asian makeup! Thank u so much for all the amazing reviews. Hi, thanks to your brand I have become better informed about the various Asian brands and do not hesitate to use your opinion as recommendation. I love you blog because you have so many reviews on products no one has reviewed before. All the products are very interesting to read about. I want to try them out. Thanks for teh giveaway! I love your blog, it feeds my cosmetic addiction. Hi lotus palace! It's my first comment but I think this is a good event to tell you how I do like your blog! In fact I'm french and a big fan of asiatic makeup and skincare products. Thanks to your blog, I can compare and chose my products in better conditions. So please, don't change your work! Wonderful that you're holding a give-away. weehee, another Kathi giveaway! I probably do not stand a chance because you have a million followers (and with a good reason, that I will tell you later) but you never know if random.org is merciful to me. Thanks for the giveaway!! i love your blog this is my go to place to for japanese makeup reviews. Keep it up! Love your reviews, swatches & EOTD best! amazing! i love to be part of the giveaway! I would love to see more reviews on skincare products like skinfood, etude...etc. I would like to see more reviews over Korean skincare/makeup products. I love your blog because I love japanese / korean makeup, and you always have awesome great reviews on them :D Please enter me in the giveaway! I like how your always one of the first to review a product. When i search for a review on an asian product i always end up on your blog :) ! I love your pink background and your cute logo up top. I'm already a follower!!!!! I'd like to see more NOTDs! I love visiting your blog because you focus on japanese brands. this helps me so much when I'm shopping online like at sasa and I need to know all about the product before I buy it. One thing I'd love to see more is postings of ingredients lists (picture or typed form). This stems from me having allergies and I always have to read labels, and since sasa and most other places don't provide a COMPLETE list of the ingredients, only "o it contains ginseng and root extracts", I really look for product reviews that have ingredients posted. I would look forward to more reviews from you would be good enough! i love all your fantastic reviews on asian items not many people write about! i love how you review products that are asian brands and so cute;; i love all the pictures you include in your posts! I love your reviews on Japanese and Korean beauty products! Especially the budget friendly ones and COMPARISON REVIEWS!! I love how you review many items weekly! Thank you for reviewing all the items you buy! Wow ... that is so incredibly generous of you that I'm utterly speechless! >_< I could never afford it - I'm moving to another country now and it's such a huge hit on my pockets. The thing I love most about your blog is all the amazing products from brands I have never heard of, let alone seen in the UK! This blog has made me add soooo much stuff to my wishlist!! I like how you venture out into different brands that are often uncommon. And also how you are often the first people to put up swatches for seasonal items. Almost everytime I am interested in a product and go to look it up reviews, you are the first one to pop up. I appreciate that alot! I'd love to continue seeing reviews, and perhaps some hauls and favourites of the moment? i always loved your blog :) your review are thorough and true. i would like to see more full face looks where you use different products! Thanks for the awesome giveaway! I always your review and comments as reference before I make purchases.you are the best. thanks a lot. My name is Joyce and I follow as MissJayce. I always check here before I purchase skin care items. And I always look at your blog sale to see if I can find any suitable items. Your blog is like my Little black book for all my beauty needs! I love everything in your giveaway and I'm sure may others agree! Please continue to have skin care items and masks and bb creams. I love skin care>make up. I love your selection of choice nonetheless. inexpensive but quality make up! makeup brands comparison.. I love all your makeup reviews :) It would be even better if you swatched all the different colours you are reviewing on your eye/lips etc. since they usually will appear a bit different to when it is on the back of your hand etc. I love reading your blog because I get a better idea of products out there that i am curious about but have never tried. I also love the site listings of where products were purchase so it allows people to find them and look for good deals. After discovering your blog, i always look at your reviews before purchasing them in stores. Love to read the makeup and skincare reviews!! I want to see more EOTD because I think you do gorgeous EOTD! i absolutely love your blog! it's one of my favourites. i really enjoy reading your posts on hair dye and KATE palettes. it helps me make decisions in my purchases. Your blog is amazing! I used to be skeptic about ordering items from Asian brands because I can't read what's on the back and there's never really any reviews with depth but you've given me so much confidence to try! I've been able to let my cousin in China know exactly what I want to get! :) I'd love to see more revews on well, everything. Keep 'em coming. I love your blog because of the great range of asian make up reviews and your lovely personality! I absolutely adore your blog, I've gotten hooked to Asian cosmetics since stumbling upon this niche of yours and I have you to credit for it. Thanks so much for being a dedicated blogger and reviewer! I seriously love your blog and its the first place I check for swatches of Japanese or Korean cosmetics. I've made SO many purchasing decisions based on what I've seen on your blog... it just makes buying online so much easier. Thank you!! Ich liebe deinen Blog, weil du ausfürlich die Produkte beschreibst. Und weil du eben viele asiatische Marken ausprobierst. Thank you for running this blog. I would like to see more posts about inexpensive beauty items from lesser known brands. I'd like to see more FOTDs. I love you blog! I enjoy reading posts about the makeup, as well as the pretty stationary and cute things. I really like the makeup reviews you do, so it's always cool to see you review products I wouldn't have known about before. Love your blog and all the products you swatch and review! I love your reviews because that's where I turn to when I need asian makeup help. None of the people I know uses asian products. Also love your giveaways. ;) lol thanks! I like that we have a very similar skin tone. I like that you review Asian beauty products because I am unfamiliar with them, and I find your swatches of the products very helpful. I really like your choices of lip colors that you choose as well. i would love to see more reviews on acne skincare products. I love your blog!! I always look forward to see a post from you in my inbox! i love your blog :) it's very useful and if i buy a product i always check your blog first. I would love to see some more comparison posts; comparing colors and comparing quality for different products--I love it when you do those for BB creams and the foaming face wash one you did; more of them would be great! Comparing eyeshadow palettes, maybe? Hello! I love how your blog focuses on more Asian brands ^^ I'd love to see more FOTDs! I love your EOTDs and reviews of Asian brands (both high and low end). I am totally ADDICTED to your blog especially because I am also a Korean-and-Japanese-brands huge fan. Thank you for the great reviews. Keep 'em coming! i love the focus of asian products on your blog, and you update it regularly as well! maybe a few more eotd's? The reviews for the product is well detailed and before i making any purchases, i always depend on your blogs whether its a good buy or not. I love how your reviews aren't afraid of listing cons and makes product comparisons. Wow. Thank you for having this giveaway! My favorite thing about your blog are the reviews on Japanese cosmetics brand. Thank you for review them! i love the way you take pictures of products, very clear...and product reviews, of course! I'm so grateful for all the stuff you get and of course swatches. :D I'd love it if you could maybe do some comparison swatch posts for things like eyeshadows and lip colors sometimes, though, because it seems like Japanese products tend to feature similar color schemes. I love ur blog because of ur passion for Japanese makeup and most importantly beauty!!!! I love your blog for all the Asian brand reviews! Every time I make a purchase on Sasa, I check your blog first! I love the way you write and that you have very fair skin, so I can really rely on your swatches and reviews, as I´m also cool-toned and a bit below NC15. It´s very kind of you that you´re holding a giveaway, thank you! Ooh...I'm a follower of yours for quite some time now...under the name of RENA. I enjoy reading your reviews on Asian products as I cannot read all the scribbles on some products. So I find it useful that someone else helps interpret and determine really the product is good or not. New follower! I am loving your blog. I've been a reader for a few months now. I think I found your blog through another, not sure which. Anyway, I love the pink! And I also love all the different products you talk about, half of them I haven't even heard of but they sound so amazing. I love your blog! I'd like to see more Korean products reviews. simply love reading ur blog.. thank you for ue good reviews and keep up the good work!!!! Hey Kathi! I'm the girl with the problem with google reader and wont appear as your follower! lol well first thing first your giveaway is really generous! So thanks for that! One little suggest I may have is that maybe you could split it into smaller giveaways? that way it gives more people the chance of winning something that'll put them in good mood for a week :) at least that's how i felt when I won last time lol. other than that I love your blog. you've got so much reviews and what i like about your reviews is that there's a good proportion of skincare reviews vs. makeup reviews :) i'm a skincare junkie so that's quite pleasant for me. your entries are really helpful but it will be more great if you could state on the entry where did you get the products from and how much does it cost (if possible). I like that you mentioned a lot of asian brands that other blogs don't often talked about. Hello, my dear! I just want to say that I have been subbed to your blog for a very long time and I am ALWAYS, always looking forward to your new posts! I know I don't stand a chance to win this, but it's not so important, as I am not an occasional follower! I will always stay subbed to you, as I simply love your blog! Thank you for finding my ideal product- Kanebo Media Powder. I love the variety of the products you review! Please enter me in the giveaway, thank you! i like the reviews that u gave to us. They are really informative. I'm definitely looking forward to read some western skincare post as well as western makeup post in the future. Have a great day & thank u soo much for those wonderful goodies. Hello!! I have been following your blog for a while but am a silent reader most of the time. hehe. Well... I love that you do not only reviews on high end Japanese brand like Lunasol but also give reviews on lower end brand like Kate (especially Kate! ), and so often too! 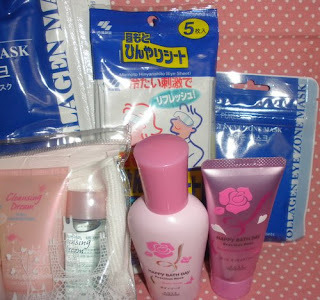 i almost can get the review about japanese stuff that i wanted to buy in your blog..
its great to have someone do so many reviews on asian skincare and cosmetic products, especially those i can get from Sasa! thank u so much! i would love to enter your giveaway please! getting product reviews just brightens up my day, your post are no different ^_^. Is my first time visiting your blog.I got your link from another blogger`s blog. Your blog did give me a rough idea of different types of makeup ideas. I did not notice there are so many nice product till you point it out. I love your blog because it's so comprehensive! I keep on discovering new things :) Crossing fingers for your givewaway! I always enjoy reading your blog for the very helpful and insightful reviews that you give on the asian products. Thanks to you, I've discovered many items that I'd like to try and often do try. Thanks for hosting this blog giveaway. I always love your skincare posts! I love ypur reviews, i love read aboud japonese and asian brands! haha, I accidentally posted on the other post. Anyway Keep up the amazing reviews! Thanks for doing the giveaway! I love how you review Asian brands, because not a lot of bloggers do that. wow, lots of girls are entering you giveaway!! Really want you to do some EOTD or review more on perfume. love your swatches! they're always so accurate to what it is in real life =D thanks for the giveaway! the products that you review are high quality and not very expensive (well most of it). and you always tells us where can we purchase it,got acquainted with adambeauty,alphabeautyuk and sasa(my fave) because of you. your opinions are really honest.most of the stuff that i own and love are bought because of your reviews. 3)sana URUOITASHI Moisture Gel,yup you are right i cant resist the cuteness and the hydration this product gives me. What a lovely giveaway. Thank you so much. it's so nice of you for giving away prizes. . I like the fact that you review almost every asian product I search for! I always end up back here haha. i love the way you take the photos on ur posts (esp.the FOTD and LOTD).. I love your blog and I hope you continue updating it for years and years! I love your blog!! I check it out almost everyday :) I like how u review many different products.. it really helps when I want to try new things! :) Thanks! I really like when you do more comparisons of similar products between different companies, like what you did for the BB cream and foaming face washes! Love the blog - keep us updated on ur latest beauty adventures! I love your blog, I live in Brazil and I keep updated about asian cosmetics. But I love more your blog now WORLDWIDE GIVEAWAY!!! I would like to know more about how you make up, not only the products that you use. Kathi, you always do a great job introducing us to new Asian cosmetics! I like your reviews on japanese pdts. I'll like more reviews especially on concealers. Thank you for the giveaway. I <3 your blog. It is epic and awesome, and the design is very cute. I'd like to see some reviews on makeup brushes if possible...rather than just beauty products. hey (: your blog is AMAZING, i love how all your reviews because it can really help someone who is quite clueless about asian brands like me know what is worth buying - thankss so much! Loving your reviews on Jap products, perhaps some Taiwanese soon? first time enter giveaway post! really love your blog, and looking forward new range of make up views! I'd love to see more posts about blush! I just created a blogger account because you asked me to, must I say more to prove that I really enjoy reading your blog, and that I'm happy when I see you've got a new post? :) Keep it going, I've got several lemmings thanks to Lotus Palace! Yay, thanks for the giveaway! I love your blog, your reviews are very well thought out and very thorough! I love how you show many different types of beauty products on your blog. The products I get here at home seems a little boring but its nice to see all the other little interestings products on the other side of the world. You are definately the go to blog for all things Asian and Japanese. Thank you so much for introducing the best products! I love all things Asian both bath and body and cosmetics! For some reason they make you feel more pampered than most American brands! Love your blog! Best asian products review. Hi, i just discovered your blog and i love your reviews ! It's good to know how are the products before purchasing them, and you do it nicely. I ordered some products from UNT and waiting for them. The reason why i would like to get such a gorgeous giveaway is because i'm new to asian brands and i'd love to try them. Please let me in ? I would really love to see more posts about how to pick out a BB cream. I am so lost on that! I like your reviews and how you review asian makeup as well as small brands that are really good. It gives more awareness to the brand as well.